YES! I am interested in discovering what is wrong with my clinics marketing – and being shown how to fix it! I want to apply for a 100% FREE Marketing Plan Strategy Call with a senior member of Paul Gough’s Marketing team to review/revamp my current marketing plan - and dramatically increase the number of new patients I am getting at my practice. Get Your 100% Free One-On-One Consultation And Discover How To Get More New Patients In a Month – Than Most PT Clinics Get In A Year! Do you feel you should be more successful in your physical therapy clinic, making more money with greater ease than you are today? Are you unsure where to start when it comes to marketing? Perhaps you’re excellent at the clinical side of things, but simply lack the experience in marketing you need to make good decisions about what to do and what activities will give you the highest and best results? Does it frustrate you how difficult it is to get prospective patients to see the value of what you do… and aggravate you how UNWILLING they appear to be to pay for high quality physical therapy? Are you fed up competing on price and having to work so hard to get a patient to understand why they need to have more than just the “one or two sessions” they tell you is all they want to pay for? If that’s you, I want you to know I completely understand and agree… it SHOULD be easier to market a physical therapy clinic and attract the right patients. Well, the good news is that it CAN be. You CAN attract more appreciative, more compliant patients - happy to pay in cash. You absolutely CAN implement a marketing system to attract the types of patients you want and are willing and happy to pay for your services, what ever you charge. You CAN stop chasing referrals from doctors, relentlessly knocking on doors, asking to leave business cards and always hoping you’ll get a few more calls and YES, you can stop the madness of posting on social media every minute of the day in the vain hope that someone – anyone - will call you. I know, because I’ve already done this for my self and 100’s (closing in on 1000’s) of physical therapists, just like you. And now, I want to help you. 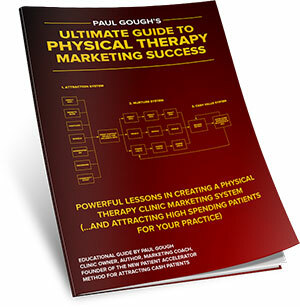 Well, I quite literally “wrote the book” on physical therapy clinic marketing. 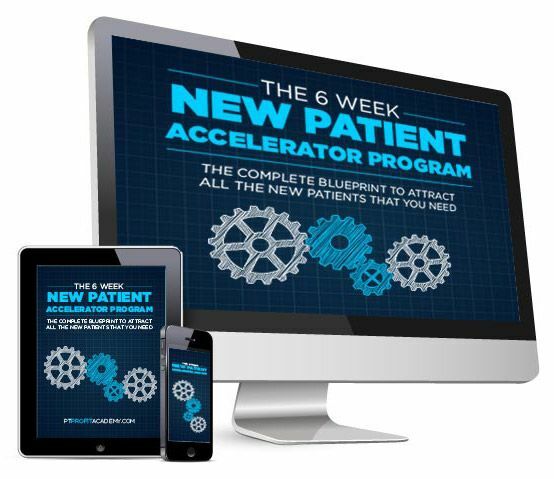 My book, the New Patient Accelerator Method went straight to Number 1 and became a worldwide best seller on Amazon, with 1000’s of copies sold to physical therapists in 37 different countries. Over the past five years I’ve coached and consulted with 1000’s of Physical Therapy Business Owners to create marketing systems that deliver more (and higher spending cash pay) patients, increase profits and build a more lucrative, predictably profitable business. What’s more, I continue to run and grow my own clinic – The Paul Gough Physio Rooms – a clinic that I started from a spare room in my home with no money down, and zero business or marketing experience. I’ve headlined at dozens of industry marketing conferences including speaking at the 10,000+ APTA, PPS Annual Conference where I taught my proven system for attracting new patients to clinic owners just like you. Putting my usual “British modesty” aside, all of that means I am THE person to go to when it comes to sorting out your clinics direct marketing. If you qualify, I want to give you a strategic marketing planning session with one of my most experienced Business Coaches, PLUS, share with you an easy to copy Blueprint for excelling at your marketing. This Marketing Plan Blueprint will show you how to approach the process of implementing a marketing plan to increase your revenue, attract more HIGH SPENDING patients - and will put an end to the madness of thinking that you have to rely upon insurance companies or doctors to survive in private practice. There’s no charge for this, and it only requires you to complete the confidential Application Form below so we can prepare for your private consultation. This call will last approximately 40-60 minutes, but during that brief time we will show you NEW possibilities, NEW opportunities and reveal why you’re struggling with your marketing – and what to do about it. How Do You Compare With All Of The Other Clinics We Work With? Essentially, we’ll tell answer the question of “how do you stack up?” against what everyone else is doing in the profession right now with the number of leads, volume of new patients, prices - and profits - you’re getting at your practice. After doing this for 5 years, we’ve not only gotten pretty good at helping clinics get results fast, but also know how well you’re doing compared to the profession as a whole. Answers: The call is one-on-one, so you’ll get answers to your specific questions about implementing a marketing plan, attracting new/cash pay patients, what results to expect, what to budget for and what is REQUIRED for you to even begin to market directly to the public. You’ll get every question answered before the call ends. Help: After reviewing your specific goals, challenges, resources, budget and situation, we will prescribe which of our programs can best help you. This will not be a sales trap you are lured into and abused by. At the end of the consultation, we’ll simply give you options and details on the most appropriate services and programs for you, so you can make an informed, intelligent decision on whether or not we should work together. We will ask you to make a decision – and it’s perfectly okay if you decide we’re not right for you. Bluntly, this call is not open to everyone who runs a physical therapy business. We can not help everyone – if you’re NOT motivated to grow… if you are so clinically-minded that you can’t stomach the prospect of needing to market and sell… if you are not willing to invest in yourself or take action on what we say, you’re not for us as we CAN NOT help you. However, if you are hard working, smart, ambitions – yet are constantly held back due to your current lack of a marketing system or plan – if you see your lack of marketing system as a weakness that makes you vulnerable to the bigger hospital systems or established private practices (with bigger marketing budgets) and therefore anxious about the stability of your income, I would URGE you to take up my offer of a consultation to finally sort all of this out for you. You have an open mind and are able to focus and listen – you must come on the call with a positive attitude, and an open mind to really engage with us. I have one rule that governs all of my businesses: no moaning! The call will last 40-60 minutes so please set aside the appropriate time away from distractions and interruptions so we can have a serious conversation. You must be in front of your PC/MAC, and not driving, walking, exercising, in a coffee shop or be otherwise anything but fully engaged in this conversation. If you won’t take this process seriously and professionally, we can’t help you and as such we will not be willing to give up our time. Why Are We Giving This Call Away For Free? Ordinarily, a call like this would cost close to $500 per hour. However, we are giving it to you for Free. That’s because we know that Marketing – if you’re trying to figure it out on your own – can be somewhat confusing. And, we’ve heard from so many physical therapists like you in the past who tell us that the only thing that is holding them back from getting their clinic to the next level of financial success is their lack of marketing know-how! After all, none of us were taught how to market our practice in school – so it’s no wonder that it appears so complicated! But it doesn’t have to be that way and that’s why we want to offer this to you. Of course, we can’t promise to solve all of your clinic problems on this call – but we can promise to tell you where you marketing is going wrong and shed light on what you can do about it to fix it. Who Will You Speak To On The Call? You’ll be put through to speak personally (one-on-one) with my senior marketing person. This is the person who runs all of my clinic marketing campaigns and who looks after the marketing of my highest paying clients. It is safe to say you are in very good hands - and you will get answers to your marketing frustrations and all that we promise on this page. Worried That Your Time Will Be Wasted? I too would be worried that this consultation is nothing more than a thinly veiled sales pitch that provides no value. Therefore, I want to assure you I’ve worked very hard to make sure your time will NOT be wasted, and that you will see real value. To that end, I’m putting my “money where my mouth is” and making the following GUARANTEE: I will personally guarantee you will find this consultation to be incredibly valuable, with numerous eye-opening details, information and useful advice. If you don’t agree, let me know and I’ll immediately write you a check for $100 to compensate you for your time. In fact, we e-mail every single person AFTER each consult, asking for input on how it went. That response comes directly to me, unfiltered, and is your opportunity to say you feel your time was wasted, and that you want your compensation. TO BE CLEAR: Provided we feel we CAN help you, we will be presenting you with a few options on how you can work with us. I’m not hiding that as one of our goals for this discovery call and consultation. But – I also believe we can deliver value to you and NOT WASTE YOUR TIME. Question 1: Is your physical therapy business revenue, growth, stability and overall business “health” able to deliver the lifestyle and financial security you’re expecting and hoping it will deliver? Are you making reasonable progress? How well could you “weather the storm” of another big hospital system moving into town, the loss of a your biggest referral source, an aggressive, well‐funded competitor moving in on your territory OR simply a personal crisis that would prevent you from working? How do you stack up against your peers? Are you on par? Below? Above? Question 2: Exactly WHERE are your biggest and best opportunities right NOW to plug the holes in the profit bucket? What opportunities are you completely overlooking right now? What specific aspects of your physical therapy business and marketing strategy are in the direst need of repair? Where and how should you start to go about fixing them? Question 3: Whether or not enrolling in one or more of our programs is appropriate for you, and which programs will be help you achieve your specific goals. If yes, how do our programs work? How do you participate? What’s required of you? What is done FOR you, what is done WITH you? Step 1: To apply, please fill out the short form below. This will give us important information about your current business situation, your specific goals and what you’re doing now for marketing, so we can formulate a plan and fully prepare for our consultation. Please take a few extra minutes to give us as much detail as possible. How satisfied are you with your current marketing results? Step 2: Once you have completed your Application, you will be presented with an online calendar to self‐select a time that is most convenient for you to hold this call. This consultation will last approximately 40-60 minutes; depending on how many questions you have, so please clear your calendar of any distractions during that time. Step 3: Your application will be reviewed and, provided you meet all the criteria outlined in this page, one of my Client Concierges will send you pre‐meeting materials that you MUST REVIEW IN ADVANCE of your consultation. You will find this information extremely beneficial and interesting – and an “easy” read (most will be short, informational videos). This is NOT just “brochures” about us, but detailed information on our approach to marketing, case history and client examples, along with answers to questions I’m sure you have about us, our approach, our clients and our capabilities. If you are NOT perfectly happy with the income, take home salary and progress you are making in your physical therapy business, if you’re NOT satisfied with the growth and stability of your patient data-base, if you’re NOT completely confident in your ability to attract the quantity and quality of patients you want, why wouldn’t you say “Yes!” to this opportunity right now? No physical therapy business can thrive, be stable and secure and have the funds to invest in serving their patients properly without the ability to bring in new patients consistently and cost‐effectively. If you put it off by telling yourself, “Next month,” I can tell you a month will turn into 2 or 3, and 2 or 3 months will turn into a year. A year turns into a decade – and once that time is lost, you cannot make it back. If you are not going to book a consultation with us right now, please allow me to at least give you the this - The Ultimate Guide To Physical Therapy Marketing Success. This is an in‐depth report on why so many physical therapists struggle to get more patients, constantly fight price resistance and fail to convince patients why they need to have more than just a couple of sessions Compliance!). Inside you’ll find powerful lessons on how to attract more “sweet spot” patients with ease, along with multiple checklists and resources you’ll be shocked we’re giving away FREE! P.P.S. Are You Ready To Jump In And Get Started Immediately? Maybe you’re familiar with us and you’re a decisive, no‐time‐to‐waste entrepreneur who wants to get started IMMEDIATELY. If so, the “speed lane” is to go online to www.ptprofitacademy.com/np-accelerator and enrol in our flagship program, the New Patient Accelerator, 6 Week Marketing Master Class Program. You could literally get enrolled and have access to my BEST strategies, tools, examples and coaching INSTANTLY, within 5 minutes of enrolling. All the marketing templates, lessons, checklists, tools, examples, exhibits are available instantly via our member portal minutes after you enrol. Of course, if you have any questions and want to speak to someone before enrolling, call my office at (407) 567-0086 or email paul@paulgough.com with a pre-enrolling question. We’re Now Making $20k Cash Per Week! My Price Has Gone From $150 Per Session To $199! “We were pretty much struggling with EVERY aspect in business before working with Paul - selling, price strategy, marketing, you name it - we were always busy trying to establish a solid foundation to grow our business on, with no clear direction to head in. “Before I was spending less time with my kids, they were in school care until 6pm each night, and I was stressed out!! We had no processes or systems in place, we were just bobbing along and marketing was non-existent. “My business was struggling financially, with growing debt and revenue stagnation. I wasn’t getting the personal satisfaction or the financial reward I expected after 12 years of being in business. My Marriage AND My Business Have Improved Since Working With Paul!! I Was Scared Because Of The Cost – But It Has Paid Off Ten Fold! “I was always scared to make the decision to work with Paul because of the cost - but I knew I needed to do something, so I took the leap of faith, and it’s paying off ten fold. “I started working with Paul right after taking Business Growth School, and all I can tell you is that it’s priceless! In the space of just 2.5 years my wife and I have grown from a team of two (us), to seven, which wouldn’t have been possible without the help and support of this group. Before signing up my wife and I lacked direction and the ability to scale our business. We were doing a lot of work for minimal profit and couldn’t see how we could make our business grow. Not only that, we truly believed that this was going to be the case for the rest of our lives! I Was Hesitant To Join Paul At First - But It Was Exactly What I Needed! I ALMOST Gave Up On My Business Before Working With Paul! If You Want Higher Rates, Higher Profits And Business Growth – You Cannot Make That Happen Without This Program! Before Joining Paul, I Was Kind Of On My Own Island, Struggling With The Ups And Downs... Since Joining, I’ve Had The Best Year EVER! I Continued To Be Scared For A Month Or Two AFTER I Joined Thinking “Will I Be Able To Keep Up?” But Now I‘m So Glad I did... There’s No Looking Back now! “I am so glad I took the leap of faith to make the investment. As a business owner just getting started in private practice, I had zero confidence and no idea how to attract clients. But since joining Paul, I have the confidence to set myself up for success from the get-go, rather than waste time and money on decisions that don’t work. “I used to be stuck in the daily grind of working IN my business, now I find myself working ON my business. Paul’s coaching has helped me gain a top level understanding about how people make decisions, which in turn, has provided my business with a consistent stream of new clients and helped me reach revenue goals. “Like many other clinic owners, before working with Paul my biggest worry was “how do I get more patients? !” So I thought I had a Marketing problem. Since making the decision one of the biggest lessons I’ve learned is that my struggle isn’t getting more patients, it was figuring out what I needed to do to maximize what I’ve already got to increase revenue. My Business Continues To Grow Without Me Having To Be There, And I Finally Have Time To Spend With My Kids! “Before I met Paul I was doing everything “old school” - copying others and running around after surgeons all day. I was frustrated at not getting referrals and waiting around all day for the phone to ring - I knew there had to be a better way to run a business, I just needed to know how to do it right. When I attended Paul’s 3-day Marketing course my eyes were opened up! Working with Paul has given me CONCRETE strategies that I can easily implement. I’ve since been able to hire staff, which has freed up my time so I can spend it with my kids while still making money. “My biggest fear was not being successful as a business owner, and getting ‘stuck’ like every other solo practice owner I saw in the area. Paul’s guidance has given me the ability to think differently about how to run a business and since joining I’ve found myself raising my rates, hiring staff, publishing a book and now I’m thinking about buying a BIGGER premises. “I have a tendency to start projects and get distracted by shiny objects - and when it comes to building a business, that’s not what you need! “When it came to implementing systems and actually making them work for my business - I felt like I was in the dark… I knew what I needed to get done, but when it came to actually doing it, there were obstacles I wasn’t sure how to overcome. Since becoming Paul’s client I am a million times more confident with the direction my business is headed in. Each calls gives me more clarity and helps me move forward. I’m even converting leads steadily since taking the leap. “Before working with Paul I had a huge fear of rejection. I doubted myself and always felt bad about charging higher prices - especially with friends, family and those desperately in need, so I’d end up giving hefty discounts or offering my services absolutely free. “Before working with Paul I felt stuck. I started as a Private Pracitce owner seeking freedom and autonomy. I was always busy treating and documenting day and night. I found myself trapped in my business working harder and harder. I was busy working and trying to stay ahead, feeling tired and increasingly frustrated. This was surely not the reason why I joined the PT profession in the first place?? I was trying to shift my business model to out of network and cash, however, I was lacking the time and confidence to make it happen. Paul and his group have helped me to make that transition and my business has grown considerably. I now have multiple revenue streams in my business, no hassle patients, and our conversion rate from inquiry to paying patient has dramatically increased. “The biggest struggle I had prior to working with Paul was that I wasn’t earning enough money to support my business and I felt guilty over raising my rates. “Before we found Paul we found ourselves scrambling at the end of each month struggling with finances and having no marketing plan. Within one month of joining we raised our prices to $450 per evaluation, and have been able to recapitalize on our past patients (making more with what we have vs. always thinking we need more new clients). “Prior to working with Paul I was still working another job, running my clinic and struggling to keep up. I was worried if I could afford to join but since joining I’ve quit my home agency job, hired staff, and I’m booked out solid! Before I wasn’t making any profit, just 6 months after making the decision to get Paul’s help I’m looking at over $15k per MONTH”. “Before I knew about Paul and his services I had no form of direction, blueprint or guidance to work from. I hadn’t opened my clinic yet, and I realized that business skills are something we’re NOT taught in PT school - so I needed some help. “Since becoming a client I have moved from solo PT, to business owner. I’ve developed true friendships with like-minded business owners and I know that no matter what challenge I’m facing Paul’s team is always there to help me continue to grow.